Can you really replace your gaming PC with an entirely cloud based system? It’s probably very likely that you haven’t heard of the name Shadow. But it’s the name of a company that recently launched a new gaming PC service that’s entirely cloud-based. Now, that might sound like madness, but seeing as investing (and upgrading) a gaming PC can be incredibly expensive, Shadow’s alternative is a subscription-based affair that allows you to basically rent a gaming PC for $34.95 / £29.95 on a month to month contract. The only catch is that everything lives in the cloud like some kind of gaming PC Google Drive, and you don’t have a physical PC to show for your investment. What you do have though is a high end, 4K gaming PC (Nvidia GTX 1080, 12GB DDR4 RAM, Intel Xeon processor) that can play the likes of Anthem, Metro Exodus and Far Cry New Dawn and works exactly as a regular PC would. All you need for this streaming tech to work is a 15Mbps internet connection. At the start of this year, Shadow offered me a trial of its service, complete with its new Shadow Ghost box, which allows you to have a small representation of a PC complete with USB ports, Ethernet connection and more to sit on your desk. So I did the only thing that felt sensible to do – I threw out my current rig and made space for the new magic box. I’m now almost two months into my road test, and i’m surprised at just how normal it seems. Here’s how it’s all gone so far. If you want to buy the Shadow Ghost box to give you access to the connection flexibility of a regular PC and its associated peripherals, you can pay $119.95 / £109.95. But you don’t actually need the box at all to use the service. Instead, you can just download the Shadow app to your current PC (or any PC, or Mac, Android or iOS devices) and log directly into your account to get access to your cloud PC. But seeing as my PC is now in the bin, covered in a foxes’ buffet of old pizza and cereal, I decided to use the Shadow box. The Shadow is about the size of a thick hardback book, but features an angular and stylish design. It’s biggest appeal will be its various ports; It comes with four USB ports (two USB 3.0 and two USB 2.0), Bluetooth connection, HDMI out, Ethernet port, audio in/out and it’s inbuilt WiFi. That means you can use all your existing accessories like mouse and keyboard, and can also get the Shadow box set up with all the existing screens in your house. To be fair, I wasn’t initially aware that it came equipped with WiFi, so I had my WiFi dongle plugged into the back of it. Now that might sound stupid, but doing so did lead me to identify a problem in the design. The USB ports on the back of the Shadow are extremely close together, which means you can’t plug anything bigger than a standard USB connection into it. My WiFi dongle (that I didn't need) is a chunky lump of plastic, so when plugged in it blocked two of the other ports. It might not be a major issue but I know that I have a lot of irregularly sized USB drives. Initially, it’s hard not think of the tiny box as a PC that’s just been hit with a blast of Ant Man’s Pym Particles, but there have been occasions, both good and bad, when the illusion has warped slightly. The good part of using the Shadow service is that you can download all of your game clients, related games, and other apps to your cloud desktop like you can with any PC. You’re given 256GB of hard drive space as standard (upgradable to 1TB), which you can use to store all your content as you would normally. But, because you’re using the power of the cloud for all your downloads – and storing it remotely on the Shadow servers based in France – the download speeds are unlike anything I’ve ever seen. I downloaded Anthem (which is a cool 50GB and ever growing) in just six minutes, compared to my colleague’s three hours on a similar home WiFi connection. The bad side of the Shadow service is that you’re really going to have to fully embrace the cloud if you want this relationship to work out. Whereas you can plug in a USB to copy stuff onto your Shadow desktop, how long that takes will rely on your home broadband upload speed. If yours is anything like the average UK home, that’s never going to be a speed you can depend on. That means you really are going to have to embrace the various cloud services on offer to you, from the likes of DropBox to Google Drive, to make sure everything you need easy access to lives online somewhere. For me, that’s not an inconvenience. Nearly all of my content lives somewhere within Google’s mainframe, but you’ll need to be prepared to have a giant digital footprint too for this tech to really work. Oh, and have all services and software think you live in France. That’s because the Shadow servers are based in France, so that is where your PC technically lives now. When you first boot up the box the default language in French, so you’ll have to change it via a drop-down. Open Chrome on the Shadow and it’s in French. Go to a website and you’ll get the French version. You can change most programs language settings in the various options menus but your IP address will always be in France unless you go through a VPN. It’s February 1 and it’s snowing. This means the office is closed but because the internet never sleeps I still have GamesRadar videos to make. It’s the perfect test for the Shadow though and means for the first time I’m going to have to use it like a real PC – no excuses. But there’s immediately a problem. All the footage I need to make the video is stored on an external USB drive, and trying to directly edit it in Adobe Premiere Pro causes the Shadow’s operating speed to grind to a halt. Handily for me though, I’d uploaded all the footage to Google Drive the day before, so downloading all the files using the Shadow’s internet connection proves to be a much quicker solution than boring old physical media. Remember what I said about putting everything online and fully embracing the cloud? "It was honestly a revelation." Making the shift to online works well enough, and I’m halfway through the day before I remember that I’m not using a PC that’s sat right beside me, but nestled somewhere in France. Until the my internet goes down and everything crashes. I haven’t saved my work on the video edit for a while and now I’m starting at a black screen. I restart the box, log back in and the Shadow service blows my tiny mind. The only thing that I’d lost was my connection to the remote machine. The computer itself hadn’t crashed at all, so as soon as I reset my connection I continued right from where I left off. All the programs were still running as if I’d never left. It was honestly a revelation. But it’s real test as a PC replacement comes when you use it as a gaming machine, and for me it’s biggest test is Anthem. It doesn’t help that even redeeming the code was an issue, because as I mentioned before, EA’s Origin store thinks I’m in France. It wouldn’t let me redeem the code on the UK store, so I had to use the French version. Handily, it was a European code, so I just had to change the language settings in game. However, I’m not sure how easy that would be for a US code on another region-locked platform. Once over that small hurdle though (and waiting all of six minutes for the entire game to download) Anthem was running incredibly smoothly with all the settings tuned to Ultra. 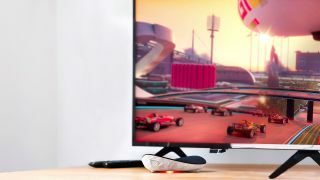 However, controlling a Javelin with mouse and keyboard isn’t the easiest thing, so I tried to connect my PS4 pad via Bluetooth, as I have before with my ‘real’ PC, but that only served to identify another small flaw in the Shadow’s design - bluetooth connectivity. Connecting devices via Bluetooth when you’re not physically next to the PC is an issue, particularly when it comes to device lag. Of course, if you’re sticking to mouse and keyboard like any self-respecting PC gamer would, you’re going to get a much more flawless result. So is it better than a regular PC? Based on my time with it so far I’d have to say yes. I’ve got a significantly better machine, which will be upgraded and maintained by someone else. All I have to do is pay a monthly fee. Sure, it has a few issues, but if you’re willing to look for easy workarounds, it’s easy to make smart decisions to circumvent them. The subscription model means I could subscribe to Shadow for about four years to match the value of the PC on offer here in that time I’d hope that (as promised by the developers) this cloud based machine would have undergone a number of upgrades to keep it in-line with the top of the range machines. There’s no doubt that streaming is the future, just ask Amazon and Netflix, and this feels like the next step. Vive la révolution.